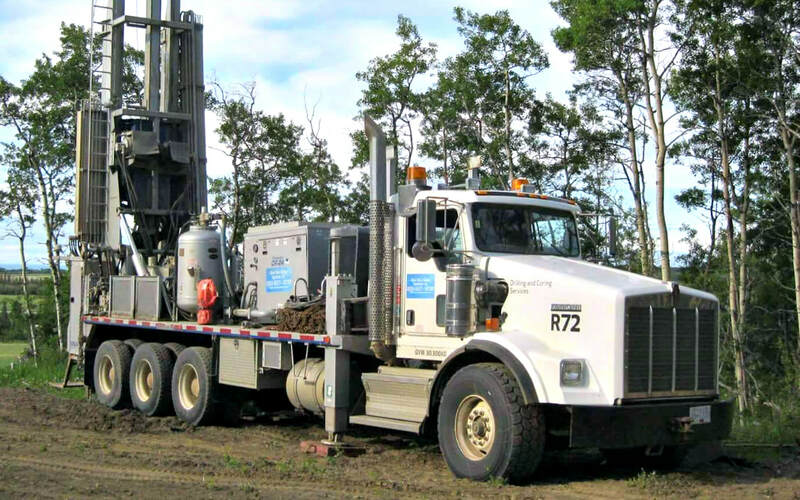 Whonnock Well Drilling Cost is available online for complete water well systems. Are you preparing to drill a water well soon? We provide you with as much information as possible to avoid dry hole drilling in Whonnock. Whonnock property owners have full access to the current local well drilling costs and all water well data without the need for a prior sales visit on your property. For current Well Drilling costs in Whonnock we need a few details about your property when sending a request for the cost to drill a well. Please read the Whonnock Well Drilling FAQ. To request a well drilling price, please submit your information, we respond quickly to all requests. Your information is always private and is only used to provide a detailed well drilling cost estimate for drilling a well in your area. Learn more about Whonnock Well Drilling Services and the cost to drill a well in Whonnock. 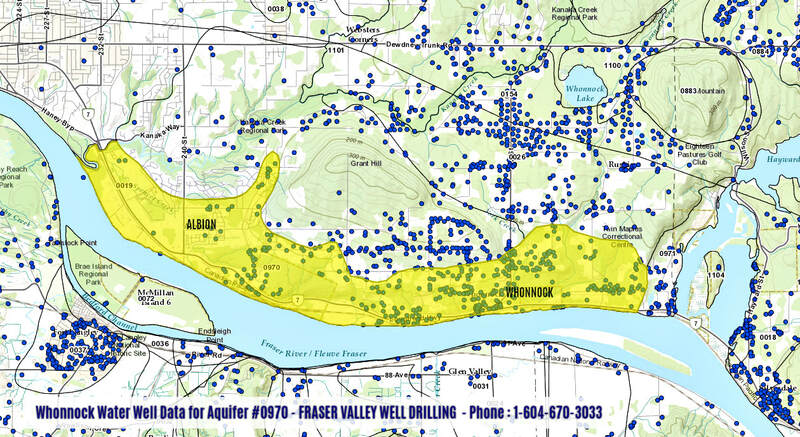 Aquifer Boundaries: The southern boundary follows the Fraser River. The northern and eastern boundaries generally follow surficial geology mapping for the Fort Langley Formation and the Sumas Drift deposits. This boundary follows the bedrock mound forming Grant Hill. Kanata River bounds the aquifer to the west. Type – Glacio-fluvial sand and gravel aquifers at surface, as well as, sand and gravel aquifers identified occurring underneath till or glacio-lacustrine deposits. Subtype - Confined sand and gravel aquifers underneath till, in between till layers, or underlying glaciolacustrine deposits. Geologic Formation (overlying materials): The Sumas Drift deposits in the area consist of recessional channel and floodplain deposits laid down by proglacial streams while the Fort Langley Formation deposits are characterized as channel fill, floodplain, and ice-contact gravel and sand intimately intermixed with glacio-marine stony silt to loamy clay (Armstrong, 1977). Thickness of the confining layer ranges from 7 to 54 ft (2.1 to 16.5 m), with an average of 22 ft (6.7 m). The confining material is described in the well logs as clay or till. Whonnock Geologic Formation (aquifer): The aquifer layers are described as gravelly with some boulders and clay lenses. The aquifer is mapped over glacial deposits and seasonal floodwater deposits found along the Fraser River. Partially Confined: The wells tapping into the deep sand and gravel layers are usually well confined. A lot of dug wells mapped in this aquifer tap however from seepages occurring within the surficial till layer. These wells have shallow water level and do not have natural protection from surface contamination. Vulnerability: Moderate. Although the confining layer appears to be consistent and reasonably thick, many dug wells are completed at shallow depths within this confining layer. This increases the vulnerability for these types of wells. Whonnock Water Well Productivity: Moderate. Reported yields range from 0 to 25 USgpm (1.6 L/s), with an average of 11 USgpm (0.7 L/s) and a geometric mean of 7 USgpm (0.4 L/s). Most of the dug wells do not have yield reported but are likely to be small producers. Depth to Water: The average depth to water is 14 ft (4.3 m), the median and geometric mean are respectively 6 ft (1.8 m) and 7 ft (2.1 m), with a minimum and maximum of 1 ft (0.3 m) and 140 ft (42.7 m). Artesian conditions were noted at 1 well. Direction of Groundwater Flow: Groundwater likely flows towards the Fraser River. Recharge: Recharge likely occurs from direct infiltration of precipitation, lateral groundwater movement from the upland areas, and/or from surface water features. The aquifer is likely hydraulically connected to the Fraser River. Whonnock Domestic Well Density: Moderate, with 13.8 wells / km2. Type of Water Use: Of 119 wells with a reported water use, 117 are for domestic purposes. One well is reported as commercial / industrial and one water supply system is noted. Reliance on Source: Conjunctive. There are 4 water licenses along local creeks and springs that are used to meet local water demands. The bedrock aquifer 0019 underlying the subject aquifer is also a source of drinking water. Quantity Concerns: Isolated. One well was reported dry. Comments: The well depths range from 1 ft (0.3 m) to 297 ft (90.5 m). The median depth is 18 ft (5.5 m), the average 36 ft (11.0 m) and the geometric mean 21 ft (6.4 m). Berardinucci J. and K. Ronneseth, 2002. Guide to Using the BC Aquifer Classification Maps for the Protection and Management of Groundwater. BC Ministry of Water, Land and Air Protection, Water Air and Climate Change Branch, Water Protection Section. Armstrong, J.E., 1977. Surficial Geology, New Westminister, British Columbia. Geological Survey of Canada, Map 1484A, scale 1:50 000. Not all groundwater wells are registered with the province, as registration was voluntary until February 29, 2016. Data quality issues may impact search results. If you are searching for information about the local water wells in Whonnock we have included approximately 150 well reports for Whonnock. Also note there will be many drilled dry wells in Whonnock that were never registered, the Whonnock well search data will help if you are researching drilled water wells in Whonnock.